Panoramic views of Cinnamon Beach, the Atlantic Ocean, and the eighth hole of Ocean Hammock Golf Course are yours from our big fifth-floor balcony at Cinnamon Beach 452. 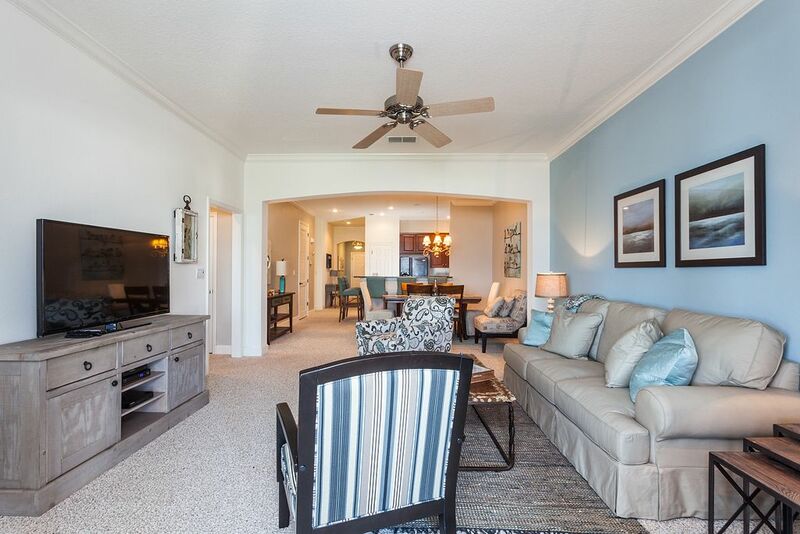 Come stay in this luxurious beachfront condo and watch dolphins cavort in the surf! The sun rises right before your eyes here on Cinnamon Beach, and you won't miss a moment of it when you bring your first cup of coffee out to the balcony. The free WiFi works out here too, so update your social media, take a few photos, wave to the dolphins in the surf, and begin another perfect day in Palm Coast, Florida. The balcony spans the full width of the condo and is covered for protection, but plenty of sunshine spills in from several directions. You'll find a table and chairs, as well as casual seating, out here. And it's accessible from the master bedroom as well as the living area. Perfect for entertaining at all hours! The living and dining areas of the condo are open so that your group stays together even when some folks are playing Texas Hold'em at the dining table while others watch a movie on the DVD player in living room. There's room for a crowd in here, between the long sofa and the cushioned easy chairs. As if all that isn't enough, the breakfast bar has overflow seating for even more! Plan to spend at least one-night "in" enjoying the comfort of this condo. Granite countertops and new appliances are the first things you'll notice in the kitchen at Cinnamon Beach 452. The wood cabinets are filled with cookware and dishes, the counters boast all the time-savers that get you out of the house and down to the beach faster in the morning (microwave, coffeemaker, and more! ), and the space is as elegant as on a cooking show! Stock up on groceries on your way into town, and you're all fixed up for delicious dining. There are a million things to see and do in Palm Coast, but you may never want to leave the master suite once you spend a night in its luxuriant opulence. The king-sized bed induces sleeping late, the private HDTV is addictive, the separate balcony access is dreamy, and the ocean views are irresistible. And of course there's an en-suite bath, so you don't have to leave the privacy of your room to enjoy a long soak in a deep tub or a refreshing shower in the walk-in. This could be a problem . . . of exactly the right kind of your vacation! The second and third bedrooms are lovely as well. Both have good-sized flat-screen TVs, and one boasts a comfy queen-sized bed, while the other has two twins. They share a second full bathroom with the living and dining area. And there's even a laundry room in the condo, so you can pack light for this trip! At Cinnamon Beach 452, everything is provided to help make your stay effortless. You have linens and towels provided for every bed and bath. A private boardwalk (with an outdoor shower at the top, to rinse off the beach sand on your way home!) leads you over natural dunes down to private, unspoiled Cinnamon Beach. This crushed coquina-shell beach is glorious for shelling, sunbathing, bodysurfing, and bocce ball playing. But should you tire of that, just come back to the resort and enjoy amenities from swimming pools to a children's splash zone? You'll find it all at Cinnamon Beach. This exclusive, gated resort is impeccably maintained. You're close to both St. Augustine and Daytona Beach here, not to mention Marineland and world-class golf. Bring your family here next time you're on Florida's First Coast, and discover just how wonderful this pristine little strip of coastline really is! Book today! Hi! My name is Steve Milo and I started Vacation Rental Pros in 2006. Our family stays in vacation rental homes whenever we travel, both domestically and abroad! I own several vacation homes and listen carefully to all our guests' feedback. Our greatest compliment is when folks refer Vacation Rental Pros to their friends and relatives. We now manage over 1,800 properties in Florida, Tennessee and South Carolina. We have homes in Ft. Myers Beach, Orlando, St. Augustine Beach, Daytona Beach, Palm Coast, Ponte Vedra Beach, Hilton Head and Gatlinburg. We booked over 15,000 rentals and received over 5,000 guest reviews in 2016. Please call if you need help booking your dream vacation! The condo unit was clean and nicely decorated. The beds are comfortable. The kitchen was minimally supplied. However, there was nothing to scrub pots and pans, one roll of toilet paper, and one tiny bar of soap for each bathroom. This was our fourth time to stay in Cinnamon Beach and the worst supplied condo unit. The lines to get past the guard house to get into the community get very tiresome. Waiting in line for ten minutes with melting groceries is not appropriate. The guard house needs to be addressed. We love the community, Flagler, and St. Augustine. We truly appreciate your feedback regarding your stay. We are happy to know that the unit was prepped and ready for you. It is our pleasure to provide our guests with the essentials to get them started on enjoying a stress free getaway and we apologize if this was not the case for you. In light of this news, we will do our best to address the accessibility of certain items for the unit. Guest safety is very important to us and are there to assist in providing our visitors as well as residents assurance. We are sorry for the delays that this may have cause you. We would be more than happy to address your concerns with the association in hope that it would alleviate the wait time for guests overall. Again, we thank you for your comments and we were glad to know that you enjoyed your stay in the St. Augustine area. Very well decorated condo. Clean, had everything we needed. Will go back! The condo was clean and had a beautiful view from the balcony. The master bedroom mattress is uncomfortable, way too firm. We tried sleeping in the guest bedroom, but that mattress was so soft it swallowed us up. We just couldn't get comfortable while trying to sleep at night. The coach was the same way, just couldn't get comfortable on it. The building was having construction done on it. Not the quite and relaxing vacation we were planning on having! We are happy to hear that you enjoyed the views that the condo had to offer. We do, however, apologize for any inconveniences that you experienced during your stay. We know things aren't always perfect which is why we take pride in our team's abilities to problem solve as diligently and efficiently as possible. We have made the necessary dictations in our system to better handle situations such as these in the future. We appreciate your feedback and honesty and we hope that you continue to book with us in the future. Great Condo, Great Location - Houskeeping leaves a bit to be desired. I didn’t rent through VRBO, so I’m not sure why I received this. Well stocked kitchen; beautiful views of ocean and golf course; a very comfortable condo! gorgeous and big. The views are breathtaking! Although we came one month after Hurricane Irma, we still had a great time! We will be back next year!! !